Don’t Earn a Darwin Award! 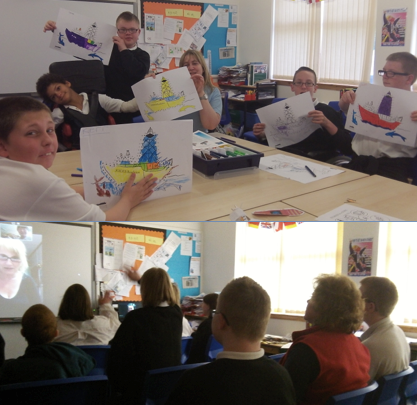 This week I had the very good fortune to be able to deliver a video-session to Pinewood School for students aged 11-16 with additional needs, in Scotland, UK. I worked with their wonderful teacher, Linda Locke, who had already introduced her students to The Joides Resolution from resources on the website, and when we made the link they were all sitting waiting with big smiles as if they already knew me! They greeted me with lots of waves and hello’s and I just launched myself in. They were very excited to be shown around the ship and were exceptionally well-behaved even when the video-link temporarily broke! I was attempting to show them our ice-cream machine at the time! However, we soon got the link back and I was able to take them around most of the ship, including one of the cabins, thanks to the generosity of one of the science staff who let us take a peek. Before I went through the door to the accommodation block I asked the students to be very, very quiet and I could see some of them covering their mouths and hear that their excited squeals had become hushed and whispered. We tiptoed down the corridor while the teacher explained why there were rails on either side. I knocked very quietly on the cabin door and in we went. I switched the light on just as I closed the door and to those waiting at the other end the picture went momentarily black, and then suddenly they were in the cabin looking at the bunks. Straightaway they started talking excitedly and when I asked them which one they would prefer – the top or the bottom one – they were all eager to tell me! I had to rapidly turn down the sound on the iPad just in case someone in another cabin could hear! They were very impressed by the idea of pulling the curtains around the bed – it is a bit like making a den under the dining table when you are 5 and having a dolls tea-party in there – is there anyone out there who didn’t do this when they were young? I swung the camera slowly around the room so they could see the desk and wardrobe, of course I didn’t open anything as someone’s personal possessions were there, but I am sure it only added to the mystery of the whispered experience! They were equally impressed when I opened the bathroom door to reveal the toilet, wash-basin and the shower! I then went outdoors and up towards the bridge. As soon as you do this you have to tackle the large opening wheels on the external doors which would normally take two hands, but when you have an iPad in one hand and the wind is blowing, things become a tad tricky! I kept explaining what I was doing and showing how big and heavy our waterproof doors are so they would understand if the picture became a little erratic at those times. What was wonderful though was that when I got feedback about the session, it was the excitement of waiting to see what was behind these huge edifices that was one of the things the students enjoyed most! They loved all the radar, control panels and steering wheel on the bridge, and then I wandered around the labs with them and showed a few pictures of some microfossils and a few attractive samples of rock. Then it was down the stairs, taking in the ‘Pet Wall’ where we have pasted up pictures of our furry friends from back home (I hesitate to say four legged since one of the pets is a big hairy spider!) and then I showed them our video-room, lounge and gym. At the end they had a few questions and came up to the camera one at a time to ask me in turn. It was great fun! This session was a high spot for me in what has been a very rewarding experience – of being able to use The Joides Resolution resources to reach out to a hugely diverse audience, taking in adult and university groups to home educators and now a group of special young people. While we only have just over 2 weeks to go, there are two more legs going out this year so hopefully more people can learn something about the science of their world and the engineering and technical challenges involved in finding out about it.